As promised, I finally got down to writing something about the very nice ceremony that I participated in on Wednesday afternoon (April 2, 2008). The story goes like this: Several years ago, when the Israeli National Electric Company requested to expand the “Zafit” electric station, which is just to the north of Tell es-Safi/Gath, they were granted their request on the condition that they give substantial funds for environmental conservation in the region. Due to this, ca. 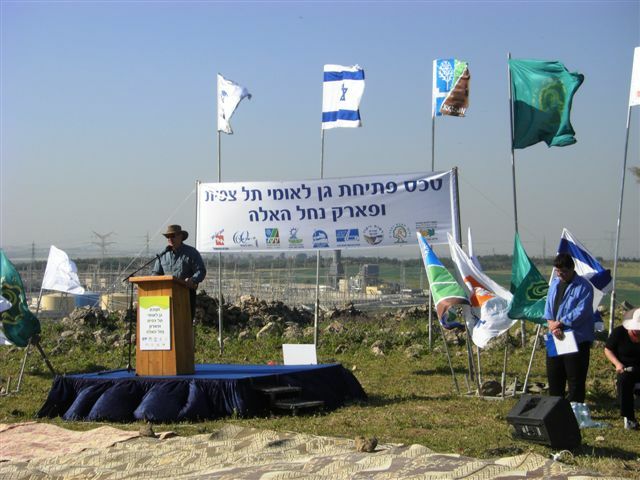 1000000 NIS were allocated for works on the Tel Zafit National Park and the Elah Valley Nature Reserve. Following a very impressive collaboration between the Yoav Regional Council, the Nature and Parks Authority, the Antiquities Authority, the Keren Kayemet (the Jewish National Fund), and several other public institutions, over the last year or so, work has been carried out at Tell es-Safi/Gath, as part of the planned opening of the “Tel Zafit National Park“. In addition, quite a large crowd of people came, including members of the el-Azi family (including the Sheikh, Yunis el-Azi), some of the Safi staff (Uri Reiss and Amit Dagan), members of Kibbutz Kfar Menachem (where up till recent seasons, we used as our field base during the summer), local school children, and many others. There was even a local choir that sang some songs during the ceremony. As I mentioned already awhile ago, among other things, they blocked off the site for 4X4 vessels, made some very nice paths, put up signs, and in general, cleaned up and fixed up the site. Here I am talking during the ceremony with all the banners and flags behind me. Particularly impressive are the signs along the paths at different parts of the tell. Most impressive is the lookout spot on the top of the tell with signs pointing out the various sites that can be seen from the top, as well as the very nice metal pole which points out the 4 other cities of the Philistine Pentapolis (Ekron, Ashdod, Ashkelon and Gaza). 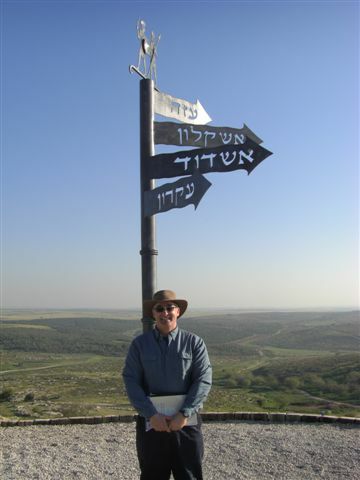 Here I am standing on the top of the tell, under the sign pointing to the 4 other cities of the Philistine Pentapolis. Note as well the very nice metal images of two Philistine warriors (ala the Rameses III reliefs from Medinet Habu) at the entrance to the site. 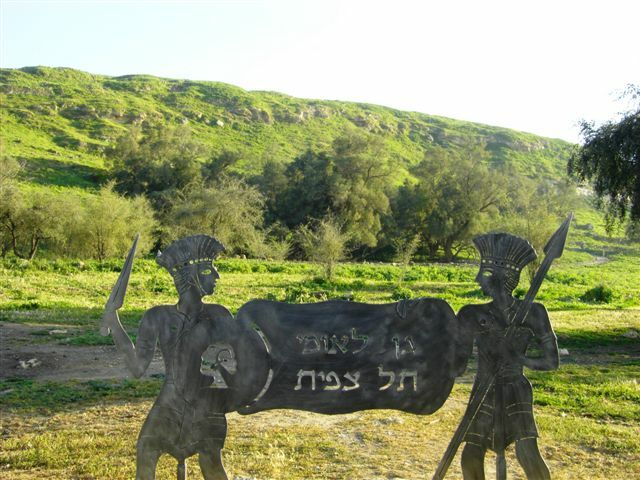 Here is the entrance sign under the tell, with the two Philistine warriors straddling the sign. And by the way – the very nice pictures here were taken by Amit Dagan of the Safi staff – thanks Amit! The “new look” of the site will be something for the team of the 2008 summer season to enjoy! Where is the sign indicating the location of the palace of Achish? What’s the difference in meaning (if any) between the Arabic “Zafit” & Hebrew “Safi”? And is one feminine, & the other masculine? 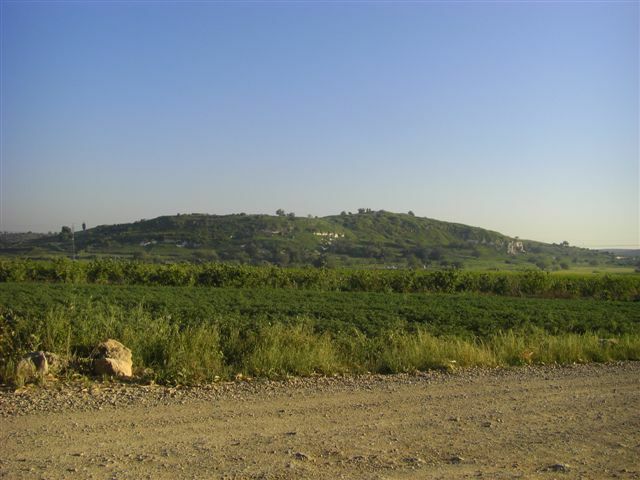 2) George – The Arabic name of the tell is Tell es-Safi (the “pure” mound). Zafit is a modern Hebrew rendering of the Arabic name. Interestingly, as recently published in an article by S. Wimmer and myself in ZDPV, the toponym Safit/Safi (etc.) may perhaps already appear in the Late Bronze Age, and perhaps, the site originally had two names Gath and Zefat (or similar). If you want more info, look at the article in ZDPV.